1. 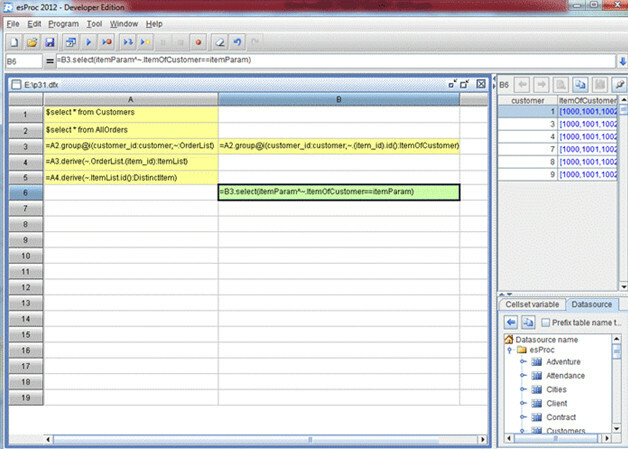 Group AllOrders table by customer_id. 2. Get sets of item_id. 4. 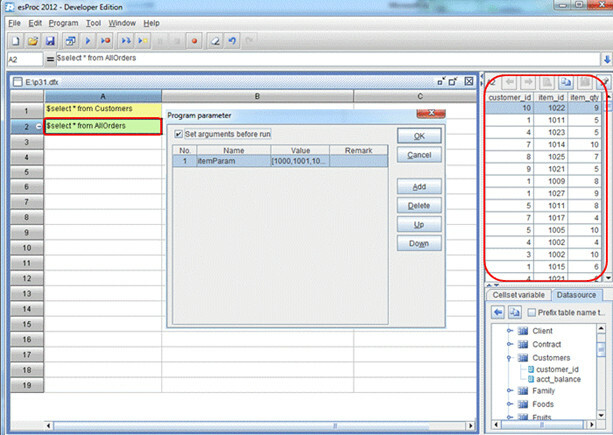 Finally, perform filter by the specified item list and you can get the required target. 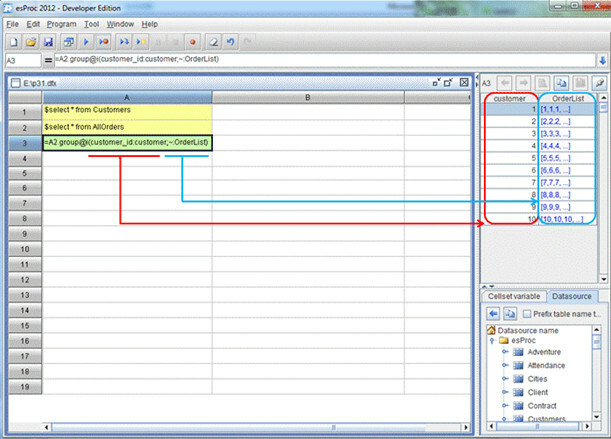 Firstly, write SQL to retrieve data from each table. 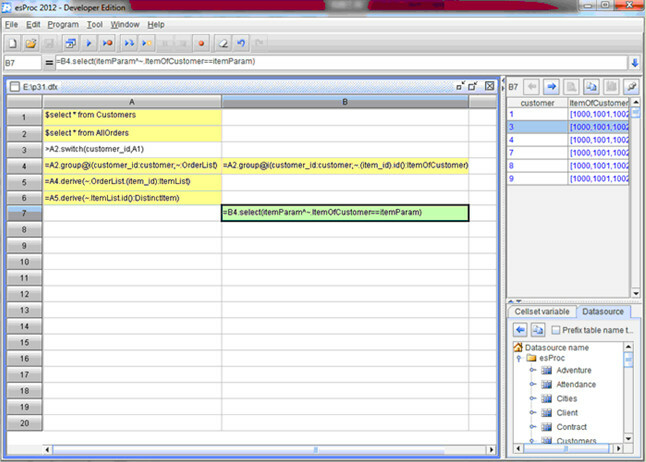 You can click on a cell to visually see the calculation result, such as AllOrders in A2 as the pic below shows. 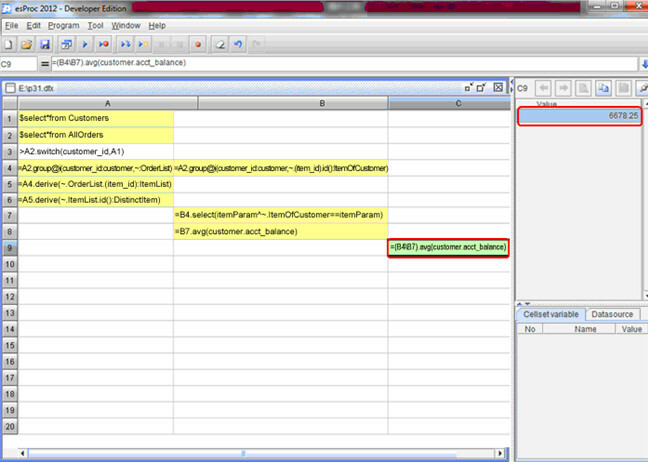 Don’t forget to define the external parameter: A specified product list. Note: ”~” represents a member of each group. 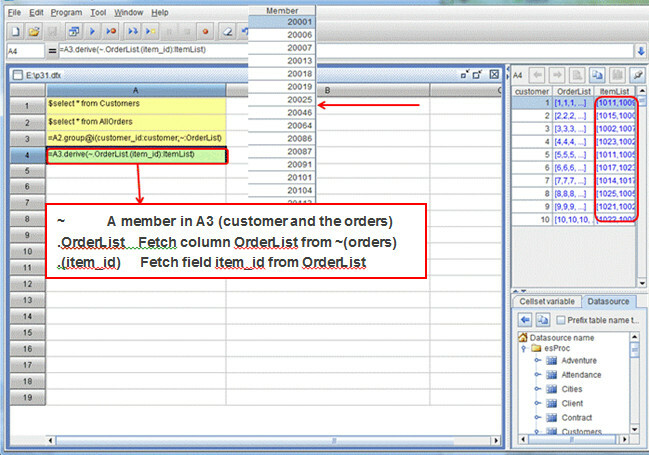 The above pic shows members of the value of OrderList field in A3’s first member. Obviously, the result of grouping is a set whose members are also sets. 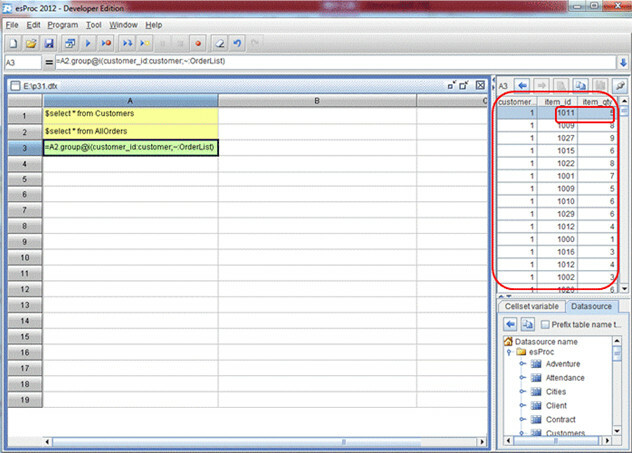 Sets make it easy to process data after grouping. 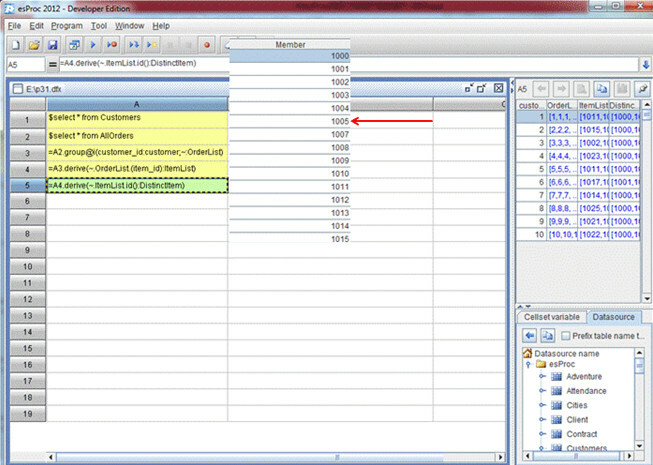 Through object references, esProc enables easy access to members of a multi-level set. You can also do it in one step like B3 as shown in the pic below. B3 equals to A3-A5. The advantage is that the code is shorter and more agile. 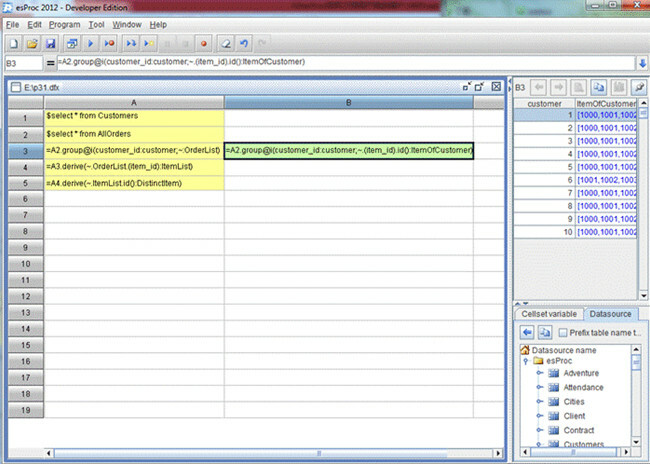 Next you reference the external parameter to filter out the desired customers, as B6 does. esProc achieves the computational object easily through object references. 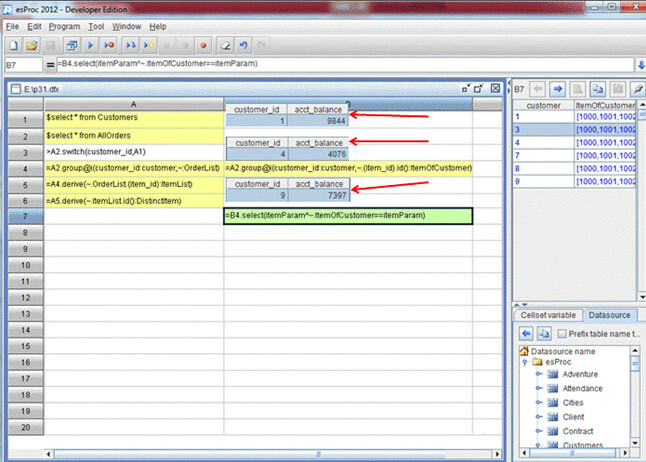 You can call the result in a reporting tool or Java application via JDBC. 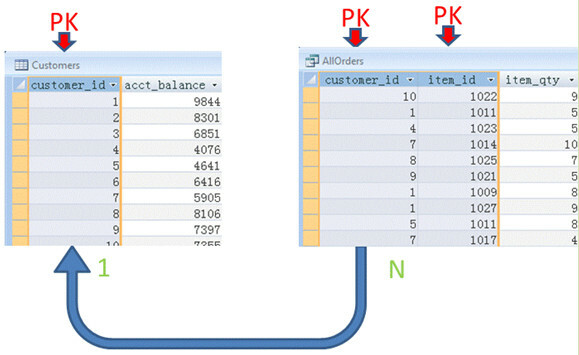 If you want to use SQL to further compute the average value of B6’s customer account balances, then multi-table association and nested computation will be involved. But through the object reference of esProc, you can avoid the complex algorithms. Now in B8, you can easily compute the average value of B7 by using object reference. 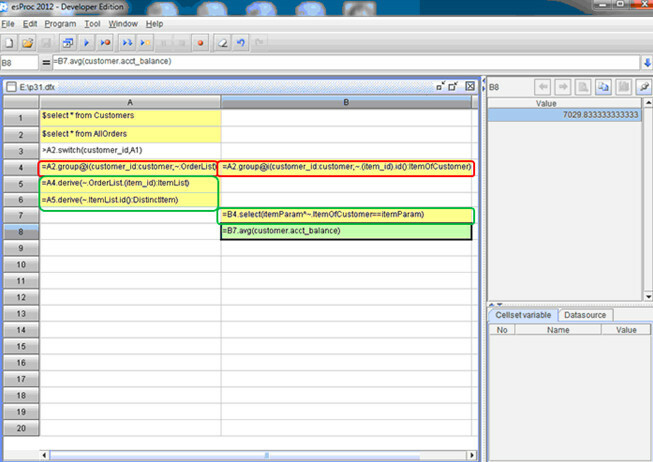 Note: An expression will intelligently changes without manual intervention while move between the cells. For example, the expression remains consistent when moving from A4 to B4, and the expressions in A5\A6\B7 adjust themselves intelligently to respective cells. How about the account balances of other users who are the users in B4 after those in B7 are deducted? How about their average balance? Look at C9 below, where the expression “B4\B7” represents the “difference” of the two sets. Problems like this can be solved intuitively by making use of set operations. Without support for explicit sets that esProc has, SQL has to deal with such a problem by transforming it into a complex query of multi-table association.